Melanoma is one of the most aggressive human cancers. Similar to many other cancers, melanoma is initiated by activation of oncogenes or inactivation of tumor suppressor genes. However, there is no database available yet focusing on genes involved in melanoma causation. In this view, Dr. Zhang and collaborators have manually curated a vast body of literature and created the Melanoma Gene Database (MGDB), an integrated database of melanoma-related genes that will help in understanding the relationship between genes and disease. The entries describing the relationships between genes and disease were manually extracted from PubMed abstracts that, to date, contain 527 human melanoma genes (422 protein-coding and 105 non-coding). Each melanoma gene was annotated in seven different aspects (General Information, Expression, Methylation, Mutation, Interaction, Pathway and Drug). In addition, manually curated literature references have also been provided to support the inclusion of the gene in MGDB and establish its association with the disease. All these information were extracted from other resource like NCBI, TCGA, COSMIC, PINA, KEGG and DGIdb, thus enriching MGDB-specific information with pre-existing external data. 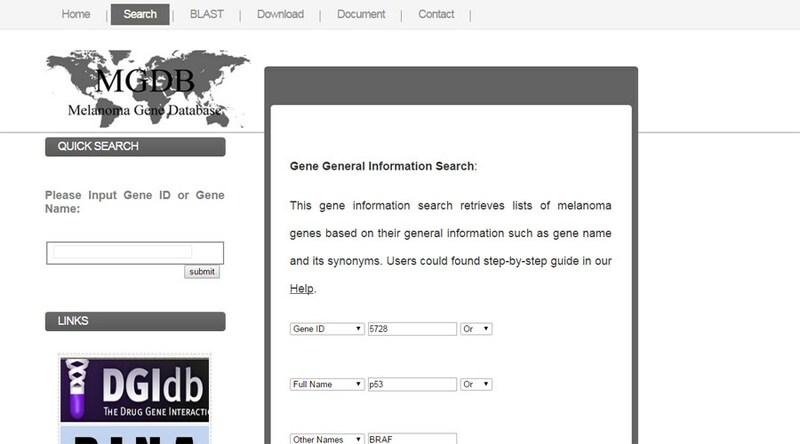 MGDB has a user-friendly web interface with multiple browse and search functions as well as a BLAST tool which makes it possible to query against the melanoma gene nucleotide or protein sequences in the database. The publication describing MGDB is available HERE. To access, browse and use these networks, please visit the MDGB Account on the NDEx Public Server. All the MDGB data and their NDEx networks are free for academic researchers, not for profit purposes. And don't forget to give back… If you use MGDB data and NDEx for your work, please cite, cite and cite!